Feeling the heat last night. What great sky colors you've captured! Initially I thought the cattle were watching the sunset too! The fire sky is beautiful and love the cows!! What a great photo! I love the sky on fire and the silhouettes. One of your best and fun photo. 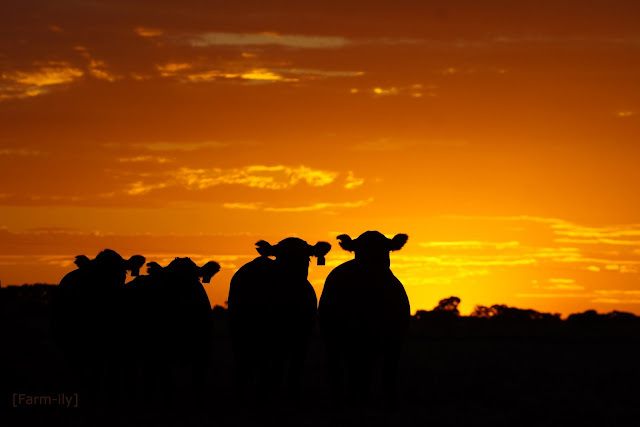 I really love these silhouettes of cows in the sunset. It looks like the sky is on fire. I, too, love the silhouettes. We are warmer today but have a system that's supposed to bring us an assortment of precipitation this weekend - rain, freezing rain, sleet and snow. It's strange to think of you on the opposite end of the spectrum. That is a cool shot! Love the colors and "shadow" cattle. But it has its compensations - that photo is gorgeous!